In collaboration with Member Pan Macmillan, we are hosting a series of events this winter examining wellness. Taking inspiration from authors published by Pan Macmillan’s wellness and lifestyle imprint, Bluebird, we’ve been gathering inspiring ideas to help enhance your personal wellbeing. These can, in turn, help develop practical skills and your creative career. On Monday the 5th of December, we launched the series with a workshop hosted by communication and personal development coach, Edie Lush. Working closely with clients, Edie helps them improve the way they present themselves professionally. She shared practical insights from her practice, as well as from her book, How to Speak with Confidence in Public. Many professional roles, particularly within the creative industries, require constant meeting with people who are short of both time and attention. To help us make those conversations as fruitful as possible, Edie guided us through strategies for beating nerves and building confidence. By exploring how we can increase our sense of presence, and make the content of our words more concise, accessible and memorable, she helped us consider how we can communicate in more effective, compelling ways. Edie insisted that no one is immune to public speaking-induced anxiety, quoting Laurence Olivier: “If you’re not nervous, you’re dead”. It was hard to believe that even someone as assured and eloquent as Edie could get nervous – but she maintained that confidence is something asserted from the outside, rather than something you necessarily feel within. She stressed the importance of appearing confident no matter how you feel inside, considering it as a cloak that you put on. 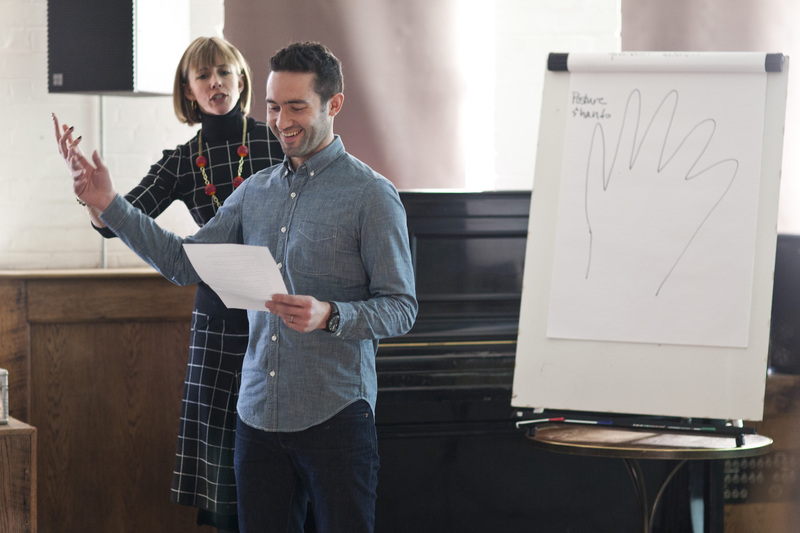 Edie’s workshops are typically interactive, based on the idea that explaining how to be more confident can only work to an extent before it needs to be put into practice. She requested volunteers come to the front and speak to the room: a dreaded question for many. Asked to talk about their job roles for thirty seconds, this gave the opportunity for the speakers to receive feedback from the rest of the audience on their deliveries. Don’t hunch in meetings – you build up the cortisol (stress hormone!) and decrease the testosterone. Edie talked us through the different ways written word and spoken word are received, reminding the audience that a speech that looks good on paper won’t necessarily sound good out loud. She explained that the impact of written word is 90% about the content and 10% about what you see. Comparatively, the impact of spoken word is only 10% about the content, the remainder being what the audience sees and hears. She talked us through some techniques that can boost the impact of spoken word. This included pausing, to give the audience time to process what they’re hearing, whilst simultaneously giving the speaker time to take a breath. Edie suggested swapping useless filler words with a pause: she herself had dropped the habit of repeating the phrase “going forward” this way. Another useful technique is Edie’s “watering can approach”, where the speaker imagines the audience as a garden. They should work to move their eye contact around to meet, or “water”, everyone, without staying focussed on one person for too long. Edie assured that such techniques help speakers avoid being confronted with “energy vampires” – the non-responsive audience members who give nothing back. Turning her attention from speech making to reading from a page, Edie invited volunteers to read out a passage of Shakespeare. According to Edie, the main things to be aware of when reading out loud can be counted on a hand. The first point referred to posture and gesture. Edie said speakers should imagine they’re a conductor of an orchestra or a magician casting a spell: body language big, open and strong. Returning to the idea of confidence as a cloak, Edie said that even if you don’t feel big, try to fake it. She also spoke about volume and emphasis. We’re used to moderating our volume day-to-day in an office environment. However, Edie explained that as a speaker, you cannot exude energy without volume. Emphasis can also help with pace, encouraging the speaker to slow down. Edie additionally suggested to try going up an octave and throwing out your voice. According to a National Theatre voice coach, it is the vowels of a word which contain the emotion, the consonants merely providing structure. It is therefore these vowels which should be accentuated, or “thrown”. Edie compared public speaking to telling a story. Considering it this way can help keep your audience engaged and ensure your words are memorable. Much like a story, Edie advised us to focus on the beginning and end when planning a speech, as this tends to be what people remember. She suggested speakers should aim to exert three main messages in a speech and to also use anecdotes. Speaking with pictures and metaphors can also be effective, as images transfer to the listeners’ long-term memory. Edie encouraged the use of character names to add colour to a speech, saying the more specific you are with description and details, the easier your message will be remembered. Constrastingly, she equally warned against becoming overly descriptive, telling us to stick to plain language and get rid of jargon. The workshop ended with the opportunity for audience members to ask Edie for advice. From how to combat voice shaking (warm-up your voice beforehand) to how to control nerves (practice mindful breathing), the useful tips concluded an insightful and pragmatic morning. Audience members left with a copy of Edie’s book in hand and, hopefully, a bit more confidence presenting. This entry was posted in Communication Training, Journal. Bookmark the permalink.